Listen as Wisdom calls out! Hear as understanding raises her voice! On the hilltop along the road, she takes her stand at the crossroads. By the gates at the entrance to the town, on the road leading in, she cries aloud, “I call to you, to all of you! I raise my voice to all people. You simple people, use good judgment. You foolish people, show some understanding. Listen to me! For I have important things to tell you. Everything I say is right, for I speak the truth and detest every kind of deception. My advice is wholesome. There is nothing devious or crooked in it. My words are plain to anyone with understanding, clear to those with knowledge. Choose my instruction rather than silver, and knowledge rather than pure gold. For wisdom is far more valuable than rubies. Nothing you desire can compare with it. “I, Wisdom, live together with good judgment. I know where to discover knowledge and discernment. All who fear the Lord will hate evil. Therefore, I hate pride and arrogance, corruption and perverse speech. Common sense and success belong to me. Insight and strength are mine. Because of me, kings reign, and rulers make just decrees. Rulers lead with my help, and nobles make righteous judgments. “I love all who love me. Those who search will surely find me. I have riches and honor, as well as enduring wealth and justice. My gifts are better than gold, even the purest gold; my wages better than sterling silver! I walk in righteousness, in paths of justice. Those who love me inherit wealth. I will fill their treasuries. “The Lord formed me from the beginning, before he created anything else. I was appointed in ages past, at the very first, before the earth began. I was born before the oceans were created, before the springs bubbled forth their waters. Before the mountains were formed, before the hills, I was born – before he had made the earth and fields and the first handfuls of soil. I was there when he established the heavens, when he drew the horizon on the oceans. I was there when he set the clouds above, when he established springs deep in the earth. I was there when he set the limits of the seas, so they would not spread beyond their boundaries. And when he marked off the earth’s foundations, I was the architect at his side. I was his constant delight, rejoicing always in his presence. And how happy I was with the world he created; how I rejoiced with the human family! In architecture, a folly is an extravagant, frivolous or fanciful building, designed more for artistic expression than for practicality. Originally such structures were often dubbed "[name of architect or builder]'s Folly", after the single individual who commissioned or designed the project (such as the massive complex by Ferdinand Cheval). "Folly" is used in the sense of foolishness, fun or light-heartedness. However, very few follies are completely without a practical purpose. Apart from their decorative aspect, many originally had a use which was lost later, such as hunting towers. Follies are misunderstood structures, according to The Folly Fellowship, a charity that exists to celebrate the history and splendor of these often neglected buildings. Follies are often found in parks or large grounds of houses and stately homes. Some were deliberately built to look partially ruined. They were especially popular from the end of the 16th century to the 18th century. Theme parks and world's fairs have often contained "follies", although such structures do serve a purpose of attracting people to those parks and fairs. 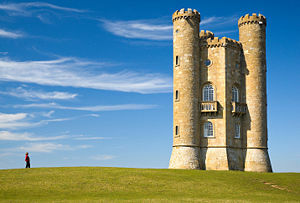 Broadway Tower is a folly built in 1797 on Broadway Hill in England. 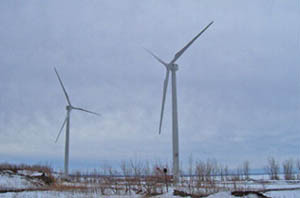 Steel Winds is a folly built in 2007 on Lake Erie in Buffalo, NY.